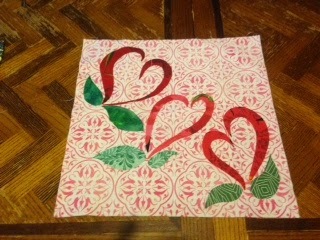 Sew Red Mystery Sew-Red-Along Revival Block 7!!!!! This is a block of optimism. It represents the result of decisions to live more greenly, to eat a more healthy diet, to let go of stress, to work to prevent or repair heart damage, to pay attention to our health and our quality of life. 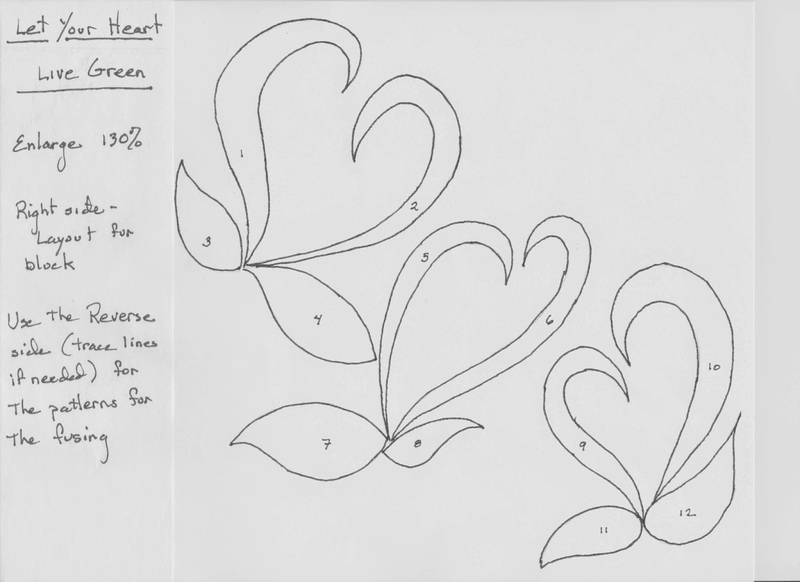 The floating hearts with wings of leaves are meant to represent the lighter load our hearts carry if we live in a healthier manner. Cut a 121/2 “ square for the background fabric. I used scrap fabrics for the hearts and leaves, but you could make the hearts the same and the leaves the same and use two 10” squares. You will also need fusing, I use the lightest available as its easiest to stitch through, but you can use your favorite. In order to obtain the patterns for the fusing from the template, first enlarge the template 130%. The pattern must then be reversed. I do this by taping the printed page to a window, printed side to the glass, and then tracing the patterns onto the fusible paper side. (If your copy is not dark enough you may need to go over it with a sharpie first.) Cut these tracings out leaving a small margin around each piece, and being sure to number each one. Iron these pieces onto the wrong side of your fabric and cut out on the design lines. To obtain a placement pattern, trace the original enlarged template onto wax paper. Place this over your background fabric. Position your pieces, remove the background paper from the fusing, reposition the pieces and iron them in place. These can now be stitched into place using whatever thread, stitch, and method you prefer. I used a small machine zig zag stitch. Stitch Red Mystery Sew-Red-a-Long Revival!!! Block 6!!! February is Heart Month, and Stitch Red is thrilled to bring you the final series in our Mystery Sew-Red-A-Long. Our talented quilt designer, Theresa Harrison, has thoughtfully created six final patterns just for Stitch Red and this series. We think her designs are gorgeous! Theresa was inspired to share this with Stitch Red and designed the finished quilt to donate to someone who suffers from heart health issues or someone who has a deserving spirit. So grab your quilting supplies, your fabric stash, and join us as we work up Theresa Harrison’s first STUNNING block for the Mystery Sew-Red-A-Long. Theresa named this block Circle of Life (with interruptions). She was inspired by playing with curves and interfering with the intersections. So many times in life our plans are interrupted or directed in a path tangential to what we planned. She has creatively interpreted this by having fabrics that meet, but not line up perfectly. After all, we take many unplanned journeys in our lives, but continue nonetheless. You will need four 10” squares of assorted fabrics or equivalent pieces. Using the templates provided, cut four of each piece. 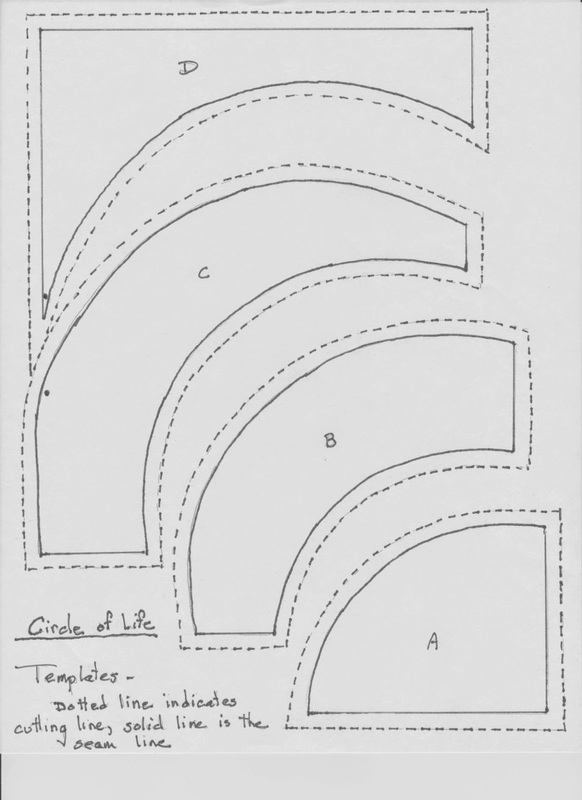 Cut on the dotted lines, and sew on the solid ones. Sew A to B and press toward the center (A). Add C to B and again press toward center. Add D to C matching the dots to line up the pieces. Again, press towards the center. Repeat this process for each of the three remaining small blocks. Trim each to 61/4 “ square. Sew two of the blocks together putting the “A”s together at the center (the fabrics will not match up). Likewise sew the other two blocks together, then the two half blocks together forming the whole. Press and trim to approximately 12” square. The fabrics intentionally are somewhat disconnected, yet still flow; indicating the detours and interruptions that happen in our lives. We can’t wait to hear about your progress on this quilt. Please share photos with us on Facebook!! !